This is Hubby's "new" toy. 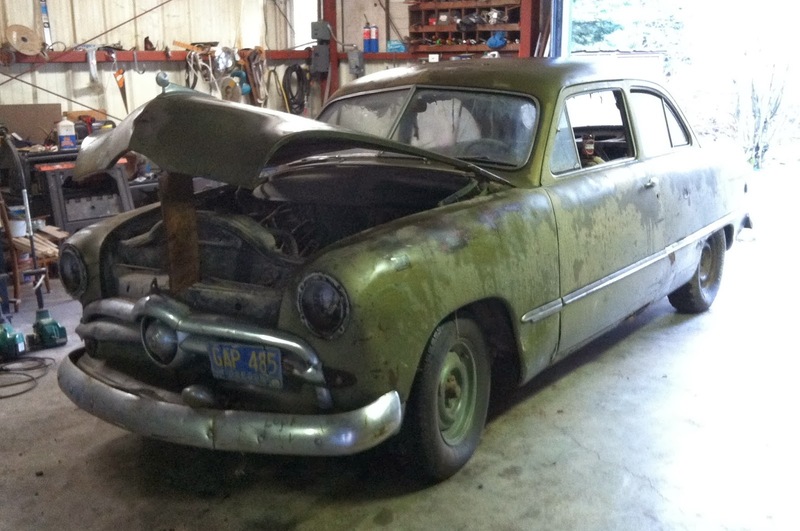 It's a 1949 Ford sedan. It was his great grandmothers. "must have just bounced off of everything." when she bought it and learned by running into things. then it sat in a barn for 30 years. Hubby bought it from his uncle about 10 years ago. Since then it has been stored at his brother's. out of the shop so there is room for it. He is like a little kid at Christmas - so excited. I told him that he shouldn't be bored for about 20 years. It will be a complete restoration. just under the hood and interior will be different. Its a two door! It would be kind of fun to just get it running and cruise around a little bit, before the total restoration. I could bring over my new toolbox. When I was a kid, Im assembled a model of a '49 Ford Tudor (two door). Neat. Very nice....my dad restored a car one time then he sold it later. I guess he did so he could say he did ...it was nice! !